This excursion gets straight to the point, taking us directly to the city's most iconic landmarks: the statue of the Little Mermaid, with its remarkable history, the royal residences and the Government offices. 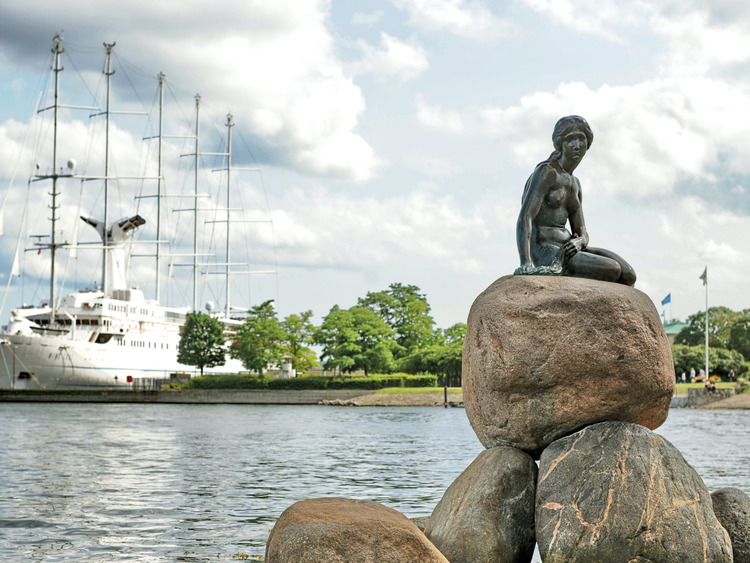 Our excursion, exploring the capital of Europe's oldest kingdom, begins with an opportunity to take photographs of the world-famous statue of Hans Christian Andersen's Little Mermaid, one of the city's most iconic symbols. Since 1913, she has sat on the harbour rocks welcoming travellers from all over the world and inspiring them with her tale of love and sacrifice. But there is more to her story than fairy tales: covered in pink paint, twice decapitated, deprived of an arm, narrowly escaping being blown to pieces, and even transported to China for the Shanghai Expo  our dear Little Mermaid has led a colourful life! The second stop on our tour is Amalienborg Palace, Comprising four identical buildings; this has been the principal seat of the Danish royal family since 1794. It is guarded by soldiers in traditional bearskin hats and is also home to the statue of King Frederick V on horseback, depicted as a Roman emperor and considered one of the most important equestrian statues in the world. We visit the palace main square and enjoy a little free time. We make our way through the district of Nyhavn and then proceed to see some of the city's most important landmarks, including the Stock Exchange and Christiansborg Palace. The latter is located on Slotsholmen, Island, fittingly nicknamed the "Island of Power" which houses the country's main political institutions: the Parliament (Folketing), the Supreme Court and the government offices (to the south and east), as well as the state rooms of the former Royal Apartments (north wing). We end our tour and head to the airport through the old Christianshavn district. We say farewell to fairy-tale Copenhagen, taking a souvenir or two, and countless memories with us. This excursion is available to guests whose flights depart after 13:00.